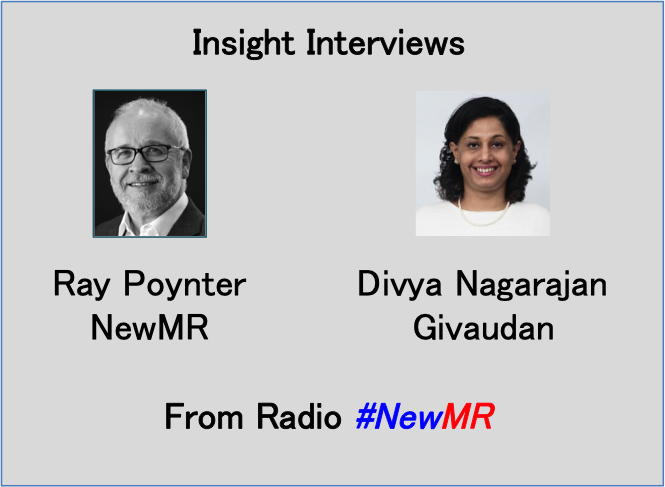 Radio #NewMR is conducting a series of interviews with key players from client-side insight functions to create a clearer picture of the changes that are taking place around the world. In this interview Ray Poynter chats with Divya Nagarajan, Sr. Segment Manager – Insights, Givaudan APAC. Givaudan is the world’s largest manufacturer of flavours, fragrances, and active cosmetic ingredients. Divya is based in Singapore and focuses on the beverages market. You can listen to (or download) Ray’s interview with Divya from the player below. We have also highlighted the key notes from the interview. Insights in Givaudan are moving more towards consumer sensory insights; technical insights that help product development and innovation. Technology as an enabler of insights – leading to much faster turnarounds and dissemination of results. However, lots of companies have not kept up with the changes and Divya sees many players needing to play ‘catch-up’. The use of consumer panels has become very widespread, even in sensory, even in APAC, because of technology enablement. Voice is being used to reach people who may face literacy challenges, expanding the reach of the research. Re-framing of the insights function. In the past insights was a place that conducted or commissioned qualitative or quantitative projects. These days insights is a business partner and an innovation enabler. This recognises that there are many different sources of insights located in different parts of the organisation – and these strands are (and need to) converge. This seems to be paving the way for a powerful Chief Insights Officer role. Insights are becoming simpler, nimbler, and entrepreneurial. One of the key developments is the rise of small brands, with smaller budgets who are hyper targeting. This has implications for research, for research providers and for the big brands. Research agencies need to stop making things complex. Keep the science, but focus on showing what it means and how to make the business impact. The research is about the customer experience, not the method, so focus on the message from the customer to the brand, and aim for simplicity. Divya is a passionate consumer marketing and insights leader with rich and diverse experience in both B2B and fmcg sectors. Her experience spans several areas such as brand building, brand communication, entry in emerging markets to specific product design and innovation. The experience of having been on both sides as a marketeer and as an insights leader has shaped her outlook on simplifying and humanising insights so that it is business relevant and actionable. Divya has a BSc. (Bachelor of Science) Statistics, Masters in Management Studies from Mumbai University, India and an MBA from Cranfield University U.K. She is also a member of the Chartered Institute of Marketing, U.K.